muscle and improve cholesterol in just eight weeks. Another winner from Phil Campbell! 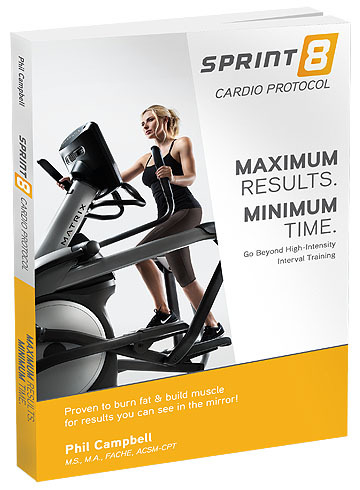 Sprint 8 is the most revolutionary training tool to come along in decades. Phil Campbell has come up with the answer to the pressing issue of the poor physical condition of the average person today. What's more, Sprint 8 is also a tightly condensed routine, so that it fits into the busy person's harried time frame. That mix - a training routine that works and is short - is a winning combination. It is amazing to be able to get significant results from a program that lasts only 20 minutes in duration, but Phil has put such a program together with Sprint 8 and he has spent 40 years researching, testing and perfecting his cardio protocol. Phil Campbell is not trying to sell you anything except a longer, healthier life. I am truly amazed at the results in such a short period of time! "Your knowledge of physiology, biomechanics, and training technique is impressive. I am most impressed with your application of these principles in what is a truly remarkable, creative, and innovative way."